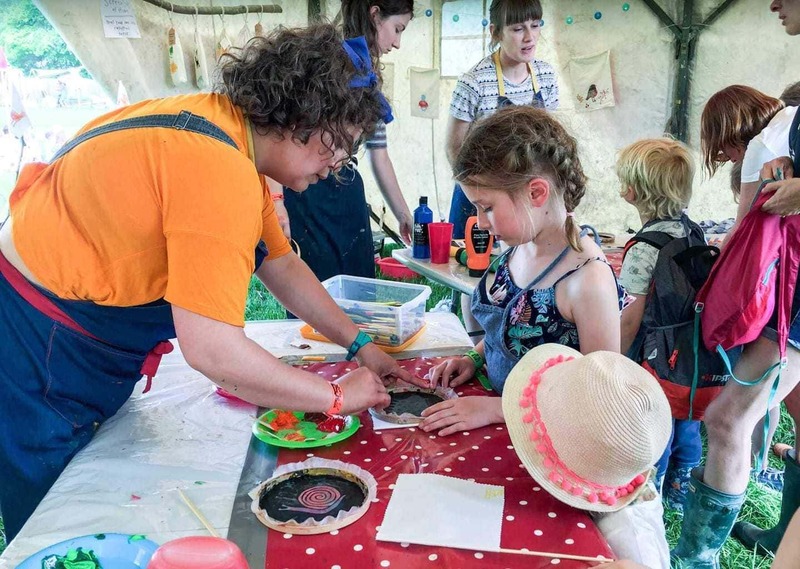 After seeing Elderflower Fields Festival included in Mini Travellers’ list of Family Friendly Festivals we were delighted to have the opportunity to go. Our daughters, aged 8, 6 & 2, love music, toasting marshmallows, and getting muddy, so we knew they would have the time of their lives. My husband and I weren’t quite as certain, having not yet spent a night under canvas as a family. Thankfully the sun shone all weekend and Elderflower Fields proved to be the perfect first family festival for us all. We had a truly memorable weekend. Our first hurdle was not owning a tent. We considered borrowing, or buying a small tent, but we decided that if were going to have a successful start to family camping, we should do it in style, and as much luxury as is possible. After much research and advice, we invested in a magnificent 5m Bell Tent from Bell Tent Boutique. You can read more about why we chose our Bell Tent, and how it worked for us here. We packed up the car to the rafters with everything we though we could possibly need, including everything on the Mini Travellers Ultimate Family Packing List for Festivals and the Camping with Toddlers list. I had a brief glimpse at the Elderflower Fields line-up when I pre-booked the children’s free arts and sports camps but my main focus was packing, and securing those last minute camping essentials. We picked up our very excited eldest children from school on Friday headed straight down to Pippingford Park in East Sussex, the beautiful estate where Elderflower Fields is held every year. This was Elderflower Fields’ 7th year and it was completely sold out, with all 5000 people camping. 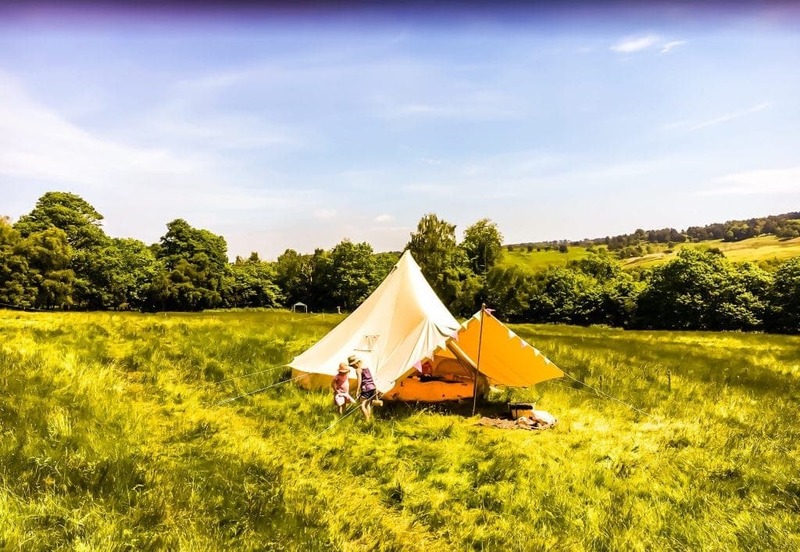 There are several camping fields to chose from, as well as pre-pitched and furnished glamping bell tents, tipis and vintage tents (reminiscent of childhood EuroCamp holidays). The biggest deciding factor in choosing a pitch at Elderflower Fields is whether you would rather be close to the festival, or the car park. Bearing in mind it can take up to 15 minutes (on a steep hill) laden with camping gear to reach the far end of the site. By the time we arrived on Friday, many of the pitches close to the car park were filling up, and those closest to the stages too. We were advised to start the long walk to the Wild Camping field, so-called because of the long grass and ‘Eco Toilets’ (which are not for the faint-hearted, but come without an unpleasant chemical smell at least). It is a little further to walk from Wild Camping to get to the action (and to fill up your water bottles etc), but the view was beautiful and the greatest advantage was space. We were one of only a handful of tents in our field. If you appreciate our own space, and shorter toilet queues, then this is definitely the location to chose. It did however take four trips with our trusted camping trolley to get everything from the car to the camping field. There are trolleys for hire, and a golf-buggy style shuttle bus, but the queues at peak times were up to an hour, and at least on the way in, it was downhill all the way. The uphill return to the car on Monday was a little more challenging. I have been advised that putting up the tent is all part of the festival experience, and not one to be hurried. We cracked open the cans of gin and tonic (no glass is allowed on site) and our rather unusual Friday evening began. By 9:30 we were all set up, with beds ready to fall into, and children dressed in cosy onesies, so we ventured out to check out the festival and get an idea of the fun to be had in the morning. We were given a programme at the entrance which was packed full of information on the many activities on offer, which we started to look through, but quickly found there was too much to choose from and as we didn’t want to spend our days looking at our watches we thought we would see what we stumbled upon. After sampling the first of many delicious gin cocktails and some Thai food we headed back to the tent, and a surprisingly comfortable 8 hours sleep. The music continued on the stages, but it did not disturb us, or our very tired children. I cannot say the same of a nearby camper who had indulged a little too much on his first night and lost volume control, but we didn’t hear a peep from him for the rest of the weekend. The forecast rain held off again the next morning and after a makeshift camping breakfast, and a coffee from the nearest pop-up for the adults, we headed out, taking our faithful camping trolley to carry inevitable change of clothes for our youngest, raincoats, water and snacks. The trolley was the perfect festival replacement for a buggy. The children hitched a ride whenever they were tired of walking, and our two year napped for a good couple of hours snuggled up under a blanket. Some seasoned festival goers had enviable trolleys with sunshades, fairy lights and pillows for the late nights. Dragonfly Hill and neighbouring Leapfrog Lawns were home to the biggest of the stages and an amazing array of activities. 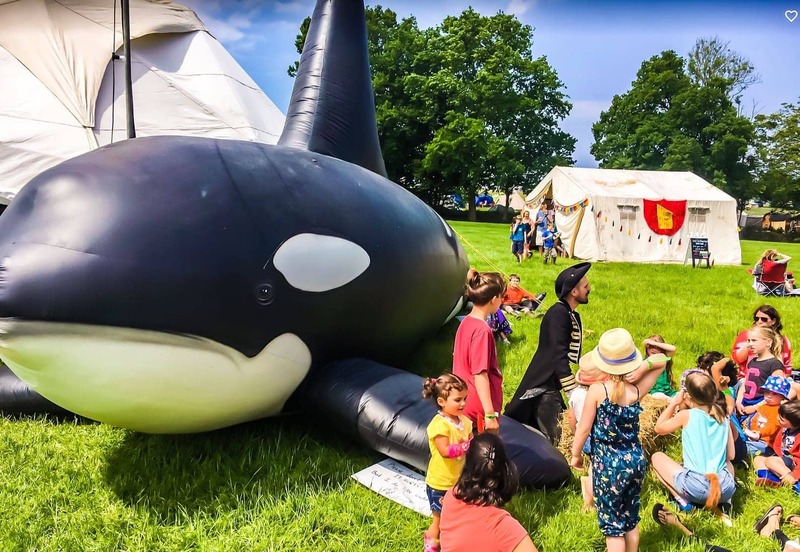 After chasing after giant bubbles we headed towards a large inflatable whale to discover a very animated pirate telling a small group of fascinated children all about these wonderful creatures. In the neighbouring science tent the girls help build a chain reaction, involving pulleys, cogs and wheels, and peered down microscopes. We bought lunch from one of the many locally run pop-ups stalls dotted all around the festival. 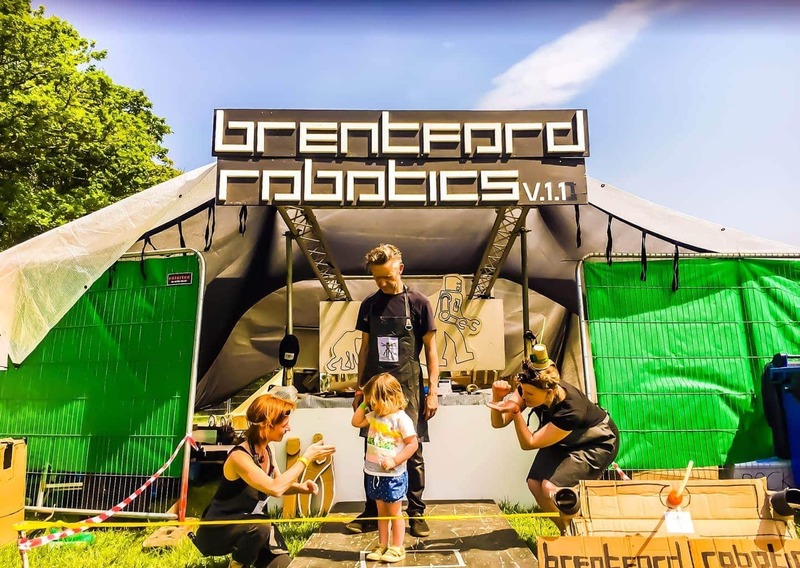 There was a great variety of food on offer, from Scandinavian Street Food to South Downs Venison Burgers, with an emphasis on locally-sourced, organic and fair-trade ingredients. 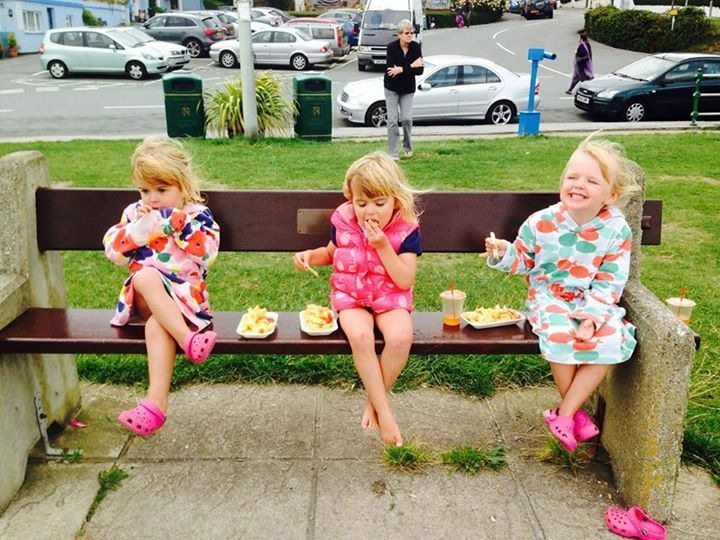 Those most popular with children, namely the Wood Fired Pizza and Italian Kitchen, had extremely long queues at peak times so we had to plan ahead, fill up on snacks, or take a gamble on something new. After lunch our eldest two daughters tried screen printing and pom pom making, whilst our youngest got stuck into some crazy disco dancing outside the big red Routemaster bus. Later, we wandered into the Lazy Glades for some shade and discovered many more activities, including a clearing in the woods where children could borrow a hammer and some nails and help build a huge boat, dens, ladders, or anything else at captured their imagination. We watched the sun go down on our first day, gin cocktail in hand, listening to live music on Dragonfly Hill, with our tired, happy, and pretty grubby, children. 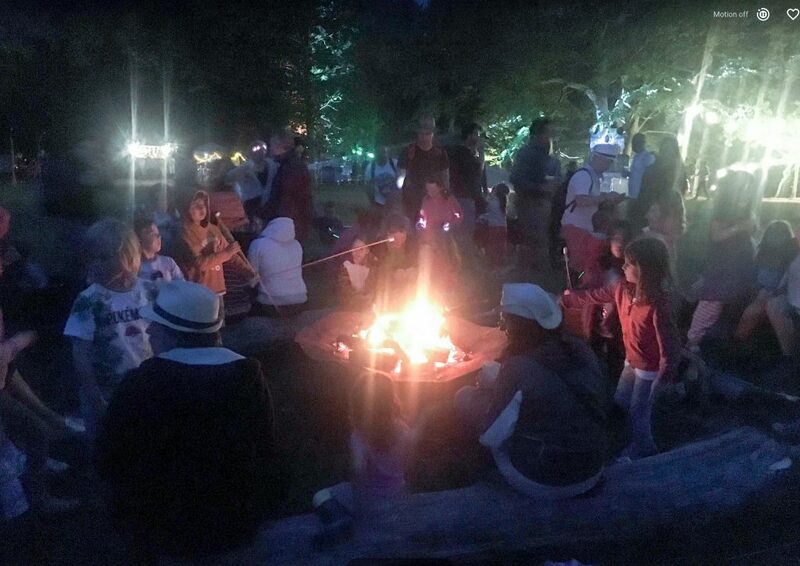 A communal campfire is lit from 6pm each night, so we rounded off the day with some marshmallow-toasting and then headed back to our tent for some welcome sleep before we started it all again the next day. Our Sunday morning started with a trip to the woodland stage where we found Nick Cope amusing children and adults with his witty lyrics. Our eldest tried gymnastics in the woods before heading to Dragonfly Hill for the Big Picnic. 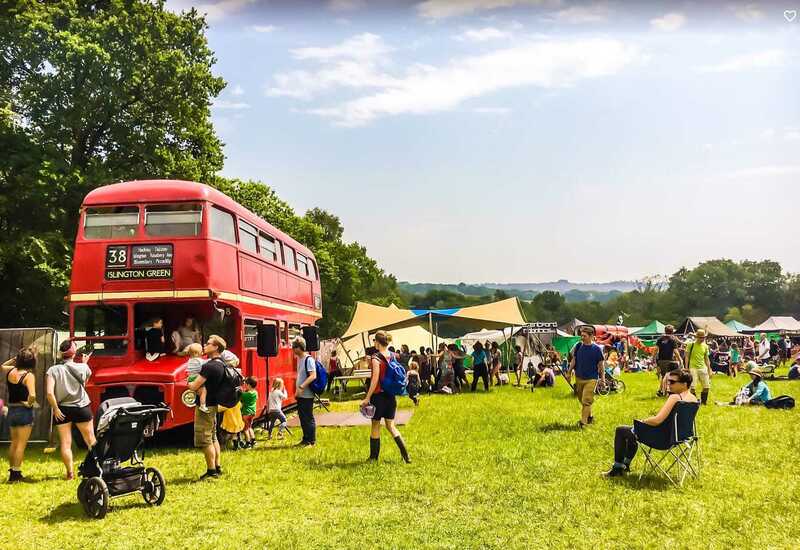 This is an annual event at Elderflower Fields, where you are encouraged to meet new friends and gather together 12 wristbands to qualify for a free picnic hamper of tasty locally-produced food. We cheated slightly by tracking down some local friends who were also at the festival to make up our twelve. Dragonfly Hill was packed with picnickers, and you had to be quick to get a spot in the shade and avoid queuing too long for the hampers. The picnic was enjoyed, before our eldest two disappeared for their complimentary supervised sports and arts camps in the afternoon where the girls tried even more new activities from fencing to clay modelling and animation. Most activities on offer at Elderflower Fields were free. 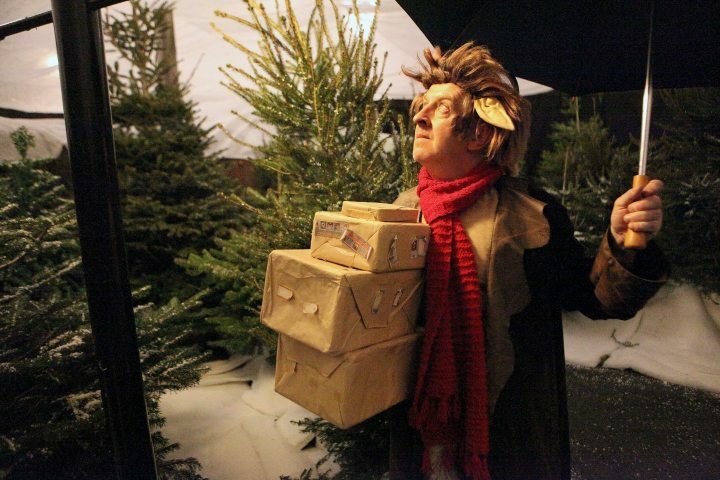 Some required booking; for example animation and circus skills were very popular but the bookings were taken just 15 minutes for a session to make them as accessible to as many children as possible. We strolled through the trees later in the day and admired the artwork of local schools, and the beautiful landscape that played host to the festival. There was so much more to discover in this area, but it was a bit off the beaten track so I am afraid we left it a but too late in the day. Our six year old enjoyed a guided nature walk in the woods, and I am sure we could have spent the weekend in this area alone. We enjoyed an eclectic mix of music over the weekend and it was wonderful to see the children enjoy the performances as much as we did. The highlight was seeing Ben Ottewell on the Woodland Stage. Just three weeks earlier I saw Ben with his band, Gomez, sell out the Royal Albert Hall. It was wonderful to be able to sit on hay-bales at the Woodland Stage with my family, and hear him sing again. Ben was joined on stage by two of his children, and then many more, including our two year old, who danced along with great excitement. The presence of the children seemed fitting for Elderflower Fields and Ben seemed to be enjoying their support, despite our two year-old charging around the stage. After another delicious meal, and some more marshmallow toasting, our weekend was complete. We had a leisurely Monday morning taking down our beautiful tent, which sadly brought tears to our two year olds’ eyes, and enjoyed lunch in a much quieter field, before heading home. Lucy & family received complimentary tickets to Elderflower Fields, but all their opinions are their own. Elderflower Fields 2019 will take place from Friday 24 May to Monday 27 May. 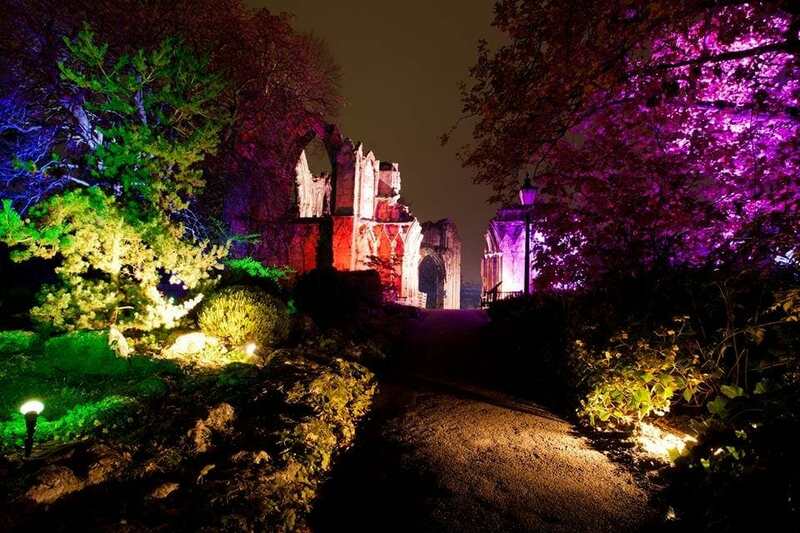 Tickets are on sale now, and over half had sold within a week off the 2018 Festival. 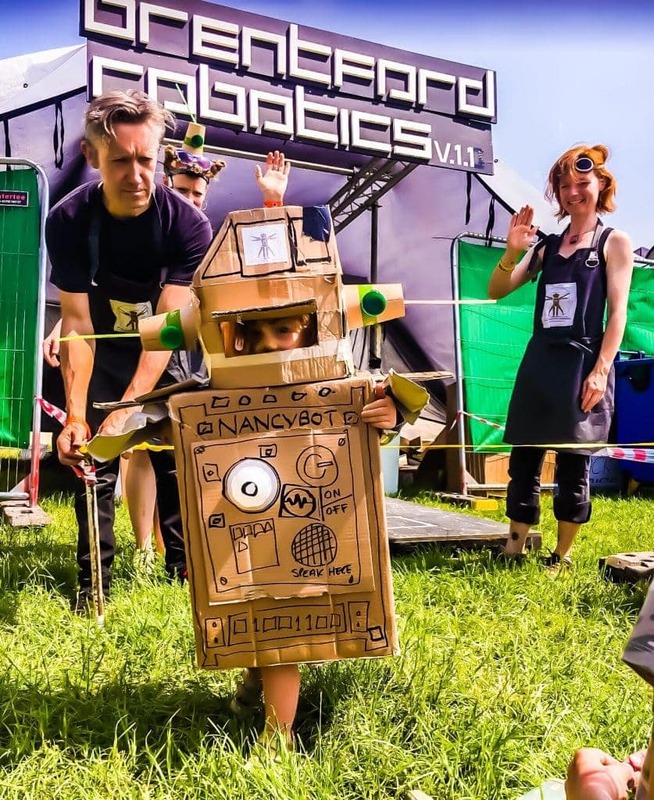 You can read Mini Travellers’ top tips for your first family festival here!